Installing an automated identification system (AIS) – an AIS transceiver in particular – was a priority for us this spring. And although it took us until July, when we spent two weeks in the mooring field at Annapolis completing our spring projects, to finally take care of the installation, it has proved to be an important piece of gear on Bear. 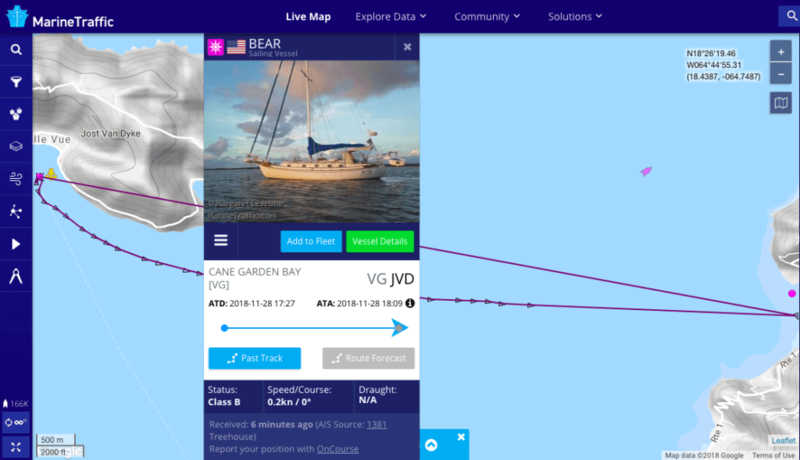 While helping bring s/v Remedy down to the BVI in 2016, I recognized how useful their AIS transceiver was on passage. We could see big ships from nearly fifty miles off, long before most radar on small sailboats would have picked them up. And we also received the name of vessels, commercial and otherwise, which made hailing them to break up a long watch with a conversation or for more important safety concerns easy. With our Raymarine chartplotter already at the helm, we chose to go with Raymarine’s new AIS-700 transceiver on Bear. The install seemed fairly straightforward. But between having to run a new network cable up the narrow tubing to our plotter, upgrade the chartplotter’s software, and deal with the confusing and contradictory instructions in the installation book and from Raymarine tech support, it took us three long and frustrating days. Though the install of the AIS transceiver took a lot of time, we almost instantly came to appreciate having AIS on Bear. Heading up the Chesapeake and down the Delaware, we benefitted from knowing exactly what shipping traffic was coming our way. We also had fun checking out and keeping tabs on recreational boats around us. And a huge, unintended side benefit was that my Mom – and a few other folks…I am talking about you, Kerry! – could keep tabs on us as we were underway, alleviating some of her anxiety. The benefits only multiplied as we made the forty-six hour jump from Cape May to Cuttyhunk. This is a screenshot of Bear on MarineTraffic.com, which is one of the sites where you can follow Bear on AIS. More than once on the passage to the BVI, Felipe, who loves new tech and was showing me things about our electronics all the time, questioned why anyone would make the trip without an AIS transceiver. Felipe raised the issue because a number of recreational boats that we talked to or saw on the way down, mainly from the Salty Dawg rally, did not have AIS at all. A few others had an AIS receiver, which gave them the ability to see other boats transmitting AIS, but not to send out their own information, leaving them invisible to other AIS-enabled vessels. While I can certainly understand the cost issue – our install ran us around 1200 dollars once everything was said and done, and we did the work ourselves – AIS would be high on my list if I was outfitting another boat for a passage. However, I also want to make clear that, for the vast majority of time, AIS just enables easier communication and promotes piece of mind rather than actually preventing a collision at sea. Moreover, a boat with radar and a crew experienced with its use would be hard-pressed to get into a situation where they would need AIS for safety (though in the thick of squalls, ships still pop up on AIS, while all you might see on radar is the wall of precipitation). Screenshot from MarineTraffic.com of current – as of me taking the screenshot – AIS traffic in the Virgins. Bear is the pink dot in Great Harbour on Jost. Having AIS makes it likely that others will reach out. While the radio chatter in the midst of the Salty Dawg rally fleet occasionally left us longing for solitude, we had a number of helpful and welcome social chats with boats around us that never would have occurred had we not had AIS. We were able to see commercial shipping from dozens of miles away, aiding in collision avoidance and making watch-keeping slightly easier (though there was also the question of whether having AIS made us a little more complacent about our visual and radar checks while on watch). There were at least two occasions where we heard commercial shipping altering their course for a sailing vessel that was ten or more miles away on AIS. AIS simply provided a diversion as we tracked other passage-making boats and checked out the size and destination of passing commercial traffic. The benefits of this should not be underestimated on passage. There was a certain comfort in knowing other vessels were out there. On about half the days, we did not make visual contact with any vessel. And on three days, we heard no radio traffic and only saw a single cargo ship on AIS. The ocean is a big place; AIS makes it slightly smaller. With just an AIS receiver, you need to be social – letting folks know you are there and checking in occasionally – and vigilant – because nobody else is seeing you – to get all the benefits of AIS. Personally, I rarely initiated contact with another boat, so having an AIS transceiver was far more useful over a receiver alone. So was AIS necessary for the passage on Bear? Not by a long shot. But it was an extremely helpful piece of equipment and is it nearly as useful now that we are in the islands, just as it was coastal cruising this summer? Certainly.